Overview - Detective Souder, a homicide detective in a small Texan town, and his partner, transplanted New York City cop Detective Heigh, track a sadistic serial killer dumping his victims' mutilated bodies in a nearby marsh locals call "The Killing Fields." Before long, the killer changes the game and begins hunting the detectives, teasing them with possible clues at the crime scenes while always remaining one step ahead. When local girl Anne goes missing, the detectives find themselves racing against time to catch the killer and save the young girl's life. It's always nice to see children follow in their parents' footsteps. The film industry is home to many such examples, with several famous families filled with multigenerational actors, writers, and directors. In part thanks to reviewers like me, who can't help but draw unfair comparisons, it can sometimes be difficult for such moviemaking progeny to rise out of the looming shadow cast by their accomplished lineage. As the daughter of acclaimed director Michael Mann, Amy Canaan Mann is probably no stranger to looming shadows. 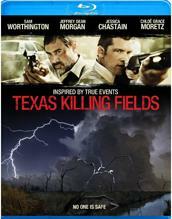 In fact, her second feature length film, 'Texas Killing Fields,' is actually covered in them, figuratively and literally. A gloomy, disturbing thriller, the film is steeped in darkness and dread. Unfortunately, a somber mood can only carry us so far, and though based on true events, the script is rather familiar and unengaging. Mann's visual style is often solid and the performances are actually quite strong, but these elements ultimately fail to elevate the been-there-done-that material, leaving a derivative work with unrealized potential. Inspired by true events, the plot follows two Texas City police detectives, Mike Souder (Sam Worthington) and Brian Heigh (Jeffrey Dean Morgan). While investigating a local murder case of their own, Souder's ex-wife, Pam (Jessica Chastain), calls on the pair to aid in catching a serial killer who has been dumping young woman in a marsh locally referred to as "The Killing Fields." Though the investigation is outside their jurisdiction, Heigh can't help but be drawn in, and when the killer starts to taunt him, the situation gets personal. As the two unrelated cases heat up, the detectives put their lives on the line to track down the suspects before they kill again. While not terrible, the script suffers from a lack of distinction, making it hard to stand above previous, superior efforts in the genre. In the included commentary, the writer discusses how he wished to retain a realistic quality, and while that is certainly commendable, in this case, more artistic liberties might have actually helped. As presented, the detective work is just never particularly compelling or interesting. The characters simply move from point A to point B, interrogation to interrogation, suspect to suspect, crime scene to crime scene, with disappointingly little narrative drive. The manner in which the two separate cases are weaved together also feels clunky and though a subplot featuring a young girl played by Chloe Grace Moretz does end up integrating into the main story, many early scenes with the character feel underdeveloped and superfluous. There are some logical quandaries that turn up every now and then as well, and while the writer does an OK job of highlighting the characters' internal motivations, some of their big decisions lack the necessary onscreen emotion that would justify them. I get that Heigh is drawn into the serial killer case because he's a good guy who can't turn his back on injustice, but with another unsolved, ongoing investigation that's actually in his own jurisdiction to deal with, it's hard to believe that he would dedicate so much time to another mystery. The screenplay even seems to acknowledge this, repeatedly, and the manner in which Souder constantly reminds Heigh that they belong in Texas City almost becomes comical. Despite these weaknesses, the script does feature some decent characterizations, and the cast does a great job of breathing life into the characters. Along with 'The Debt,' this may actually be my favorite performance from Sam Worthington, and the action star shows off some actual emotion here that works well. As the conflicted and morally stalwart Heigh, Jeffrey Dean Morgan brings a nice blend of vulnerability and strength. Though his character's choices are a bit undercooked on the page, the actor does a good job with what he's given to work with. In just one year, Jessica Chastain has cemented herself as one of the best actresses working today, and she again delivers with a commendable turn as the no-nonsense Pam. The rest of the cast, that includes Stephen Graham, Chloe Grace Moretz, and Laura Palmer herself, Sheryl Lee, all do a nice job with mostly underutilized roles. From its opening shot, featuring a dreamy, free-flowing camera, the film shows off some great potential for a visually moody experience. There is a certain somber malaise which permeates the work, evoking a very fitting and effective tone of doom. With that said, Mann's style ultimately finds a more traditional groove, pushing aside some of the hazy, dark beauty we get glimpses of in sporadic bursts throughout. Unfortunately, though perfectly serviceable, the direction does stumble at times, leaving a few key moments and symbolic visual beats a bit hollow and sloppy. The film's revelations never feel as profound or emotionally resonate as intended, and ultimately the whole endeavor feels a bit pointless and unfinished. 'Texas Killing Fields' is a pretty standard serial killer thriller. The performances are good, and there certainly are elements of the script and direction that work well, they just never completely jell together. In the end, the film doesn't seem to have much to say, resulting in a mostly forgettable entry into an already crowded genre. Unfair comparisons to her father aside, as a director, Ami Canaan Mann shows a lot of potential. It's just not fully realized here. 'Texas Killing Fields' is brought to Blu-ray by Anchor Bay on a single BD-25 disc housed in a keepcase. Some skippable trailers play upon startup before transitioning to a standard menu. The packaging indicates that the release is region A compatible. The movie is provided with a 1080p/AVC MPEG-4 transfer in the 2.40:1 aspect ratio. With its dark, occasionally dreamy visual style, the film has a decent but not exceptional appearance. Based on comments made in the included audio commentary, the movie seems to have been at least partially shot with digital cameras, and there is a light layer of unobtrusive noise visible from time to time. Fine detail is pretty good, revealing nice texture and clarity in close-ups, but the picture does have a predominantly soft look. Colors are a little washed out, reinforcing the film's gloomy subject matter. Contrast is intentionally hot with blooming whites. Black levels are nice and inky, though shadow detail can look a hair crushed. I also detected some very minor aliasing and possible edge enhancement in a few shots, but these minimal artifacts don't really detract from the presentation. While the film's intentional look is rather drab and at times unappealing, the transfer itself is solid and the style suits the content well. The movie is presented with an English Dolby TrueHD 7.1 track and a Spanish mono track. Subtitle options include English SDH and Spanish. While mostly quiet, the mix features some nice ambiance and packs a punch during its few action-oriented moments. Dialogue is mostly crisp, but there are some instances where speech sounds a little thin with very minor crackle and background noise. Various ambient sound effects, including falling rain, chirping crickets, and passing cars all help to create a subtle but enveloping soundscape with nice surround activity when appropriate. With that said, the film's many quiet stretches can feel a bit flat. During the movie's brief action sequences, however, the track does get more dynamic and lively. A chase scene near the end is particularly noteworthy, and is easily the most impressive part of the mix. Revving engines and a few gunshots offer some powerful but fleeting bass activity. Balance is handled well, with even whispered dialogue carrying ample volume and there is no major distortion among either high or low frequencies. 'Texas Killing Fields' features some decent sound design work, with a quiet, moody atmosphere that picks up nicely in a few isolated action scenes. Though a little subdued, the track is still effective when it matters. Audio Commentary Featuring Director Ami Canaan Mann and Writer Donald F. Ferrarone – The film's director and writer cover a large array of topics, including casting, locations, production design, and the real life inspirations behind the story and characters. Mann also points out a few of her favorite shots and little visual touches, elaborating on how they were achieved and what they were meant to convey. There are a few brief pauses in the discussion, but for the most part, the duo offer a steady stream of information. While not a particularly entertaining track, there are definitely some worthwhile insights shared. Trailer (HD, 2 min) – The movie's trailer is included in 1080p with Dolby Digital 2.0 sound. 'Texas Killing Fields' is a very middle-of-the-road thriller. Though the cast is strong, as presented, the plot isn't very compelling and the direction stumbles at times. The elements of a good film are all in here somewhere, they just don't come together. Video and audio quality are both solid with only some minor issues here and there. Extras are limited to a commentary track, but the discussion is worthwhile. The movie is mediocre and the disc itself is OK. Basically, this is a rental at best.